When you have multiple kids you realize how different they are and how different they learn. What one kid is good at another one may struggle to learn it. Delaney is my writer. She is always writing. She can fill a notebook or journal faster than anyone I have ever met. When the Crew was offered Classical Composition from Memoria Press I asked Delaney if she would like to use it and she was more than happy to oblige. Since she is older we received both Classical Composition I: Fables Set and Classical Composition II: Narrative Set. Memoria Press is a family-run company that offers a classical Christian education. Their composition program is based on the classical method called progymnasmata. It teaches fourteen skills and can be started as early as 4th grade. Fable is the first step and every student should begin with this one even if they are older. This level helps students engage the imagination of their audience before moving on to the Narrative stage. Since Delaney is older we also received the Classical Composition Accelerated Lesson Plans to help her move a little quicker. Classical Composition I: Fables Set includes a Student Book, Teacher Guide, and Instructional DVDs. There are 20 lessons that are set up the same way and they each start with a fable. There are teaching guidelines and examples in the appendix. Fables teach wise lessons and are easy to imitate making a great place to start your writing. The Student Book is a 101 page spiral workbook. Each lesson consists of four workbook pages and a final draft written on a separate sheet of paper. The Teacher Guide is a 101 page spiral book that lists each step making teaching this course very easy. It indicates exactly what to ask the student and includes vocabulary, an outline, and more. There is also a smaller copy of the Student Book pages with the answers filled in for each lesson. The Instructional DVDs teach each of the 20 lessons on four discs, and they are all taught by Brett Vaden. He goes through each lesson and tells the student exactly what to do. He reads the fable first and he indicates when to write things down and when to pause the DVD to complete their work. 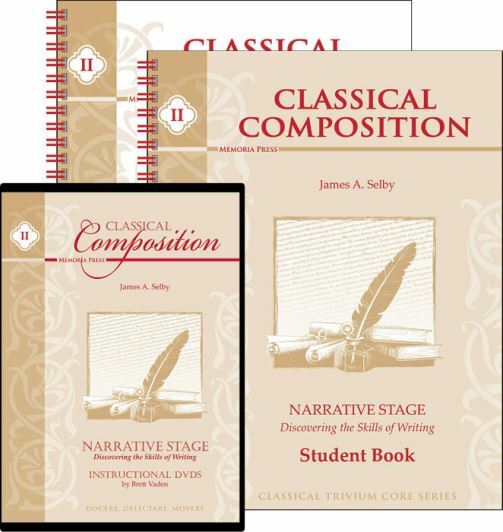 Classical Composition II: Narrative Set includes a Student Book, Teacher Guide, and Instructional DVDs. It is divided into twenty lessons and includes teaching guidelines. Aristotle believed we learn best by imitation whether it be oral or written imitation. By having the student narrate it insures their writing is focusing on the ideas instead of the vocabulary. This gives students the ability to understand the thoughts and opinions of others and to know whether they are true. The Student Book is a 160 page spiral bound workbook. Each lesson has six workbook pages to complete. The Teacher Guide is a 160 page spiral bound book. Each lesson page has a smaller copy of the lesson pages in the Student book with the answers filled in. There are also steps listed for each lesson to help the teacher with the lesson. It includes questions the teacher should ask, vocabulary words, an outline, and teacher tips. The Instructional DVDs include a segment for all 20 lessons on six discs, and are taught by Brett Vaden. The Classical Composition Accelerated I Lesson Plans combine both the Fable and the Narrative Stage together. It plans out exactly what should be completed each day of the week to finish both courses in 34 weeks. This plan is recommended for students in grades 6-12. Delaney is following the accelerated plan, but we haven't gotten to the Narrative Stage yet. The Fable lessons are all set up the same way. Each lesson has its own fable and it is always read first. Either by the student, the teacher, or by listening on the DVD. Delaney usually chooses to read it herself. Key vocabulary words are discussed to help the student understand the fable. They will also try and recognize things in their own life they can relate the fable to or find truths within the fable. Students will paraphrase words and sentences, and recognize the plot structure through outlining. Once they have an outline they will retell the story orally. Next there are paraphrasing exercises. The student will paraphrase the fable by expanding it, abbreviating it, or changing the order. They will create another paraphrase by using their outline, inverting the sequence, and reducing the fable. The last section in the lesson is the final draft. Delaney is not one to want to watch instructional DVDs. She usually just wants to complete her work on her own. She did realize it was easier, especially at first, to watch each lesson on the DVD. She is finding the work easy right now, but she is having fun with this. Writing is her favorite pastime and she likes paraphrasing the fables. She likes doing them because it forces her to write about something that is not already mulling around in her mind or in her journals. I knew Delaney wanted to work through Classical Composition from Memoria Press, but I'm thinking of ordering another student book for my 13 year-old non writer. She would benefit from this tremendously. The step by step approach would make it easy for her to complete.